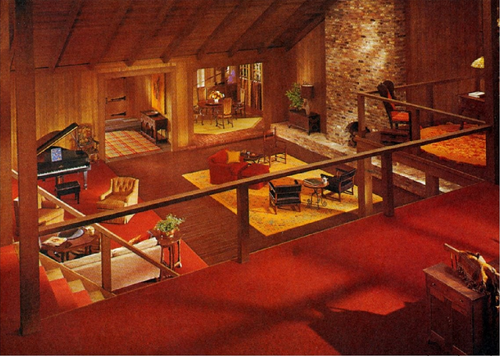 The clean lines, the geometric decorative elements, the seamless blending of indoor and outdoor space… I sure do love mid-century modern architecture. Do you know what I love more? My children. And that is why I will never live in my MCM dream home. 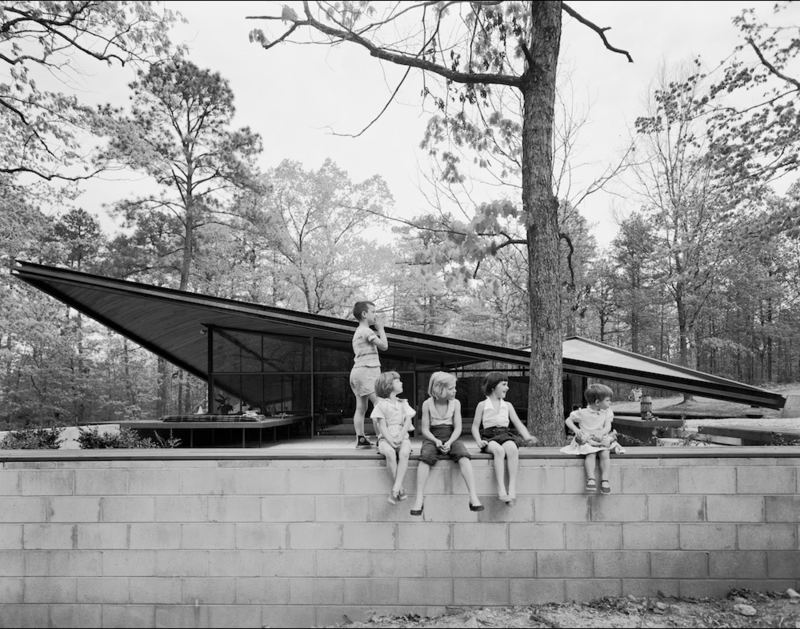 Because mid-century modern architecture is designed to KILL YOUR CHILDREN. (Also, moderately clumsy or drunk adults). We can be reasonably certain that none of these children reached adulthood. 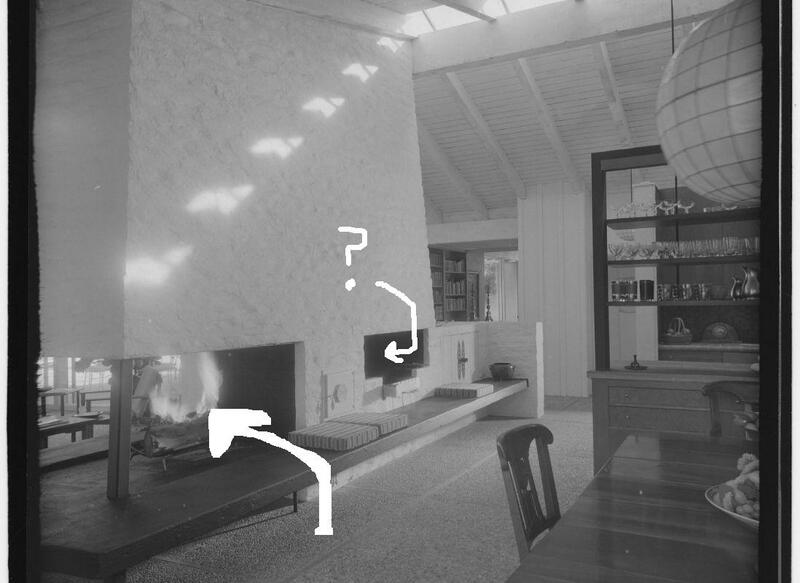 As a public service, Projectophile is alerting its readers to the dangers posed by key elements of mid-century modern residential design. What four-year-old can resist that hidden nook? That’s going to require at least ten stitches. Where are all the children? Probably under that ledge, unconscious. 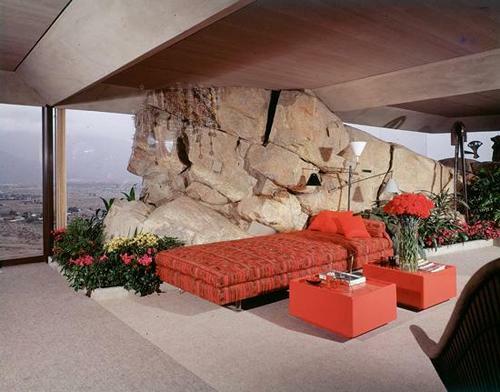 First of all, make sure your kid wears her helmet when she inevitably climbs up, and then falls of of, this rock formation in your dream living room. Be sure to check those crevices for rabid bats. As soon as you turn around to fetch the marshmallows, Junior is going to stumble right into that open fireplace (and stumble out with some third-degree burns). And watch out for that mysterious little nook on the right! 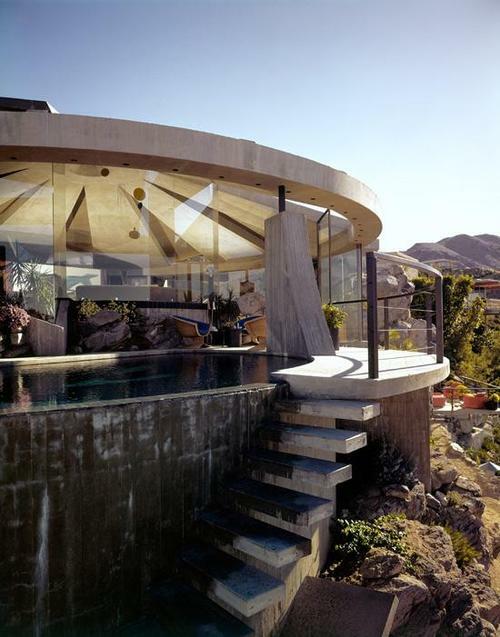 Children in mid-century modern homes are advised to wear flotation devices at all times. This glamorous couple has no idea what danger lurks in that strangely-placed reflective pool. 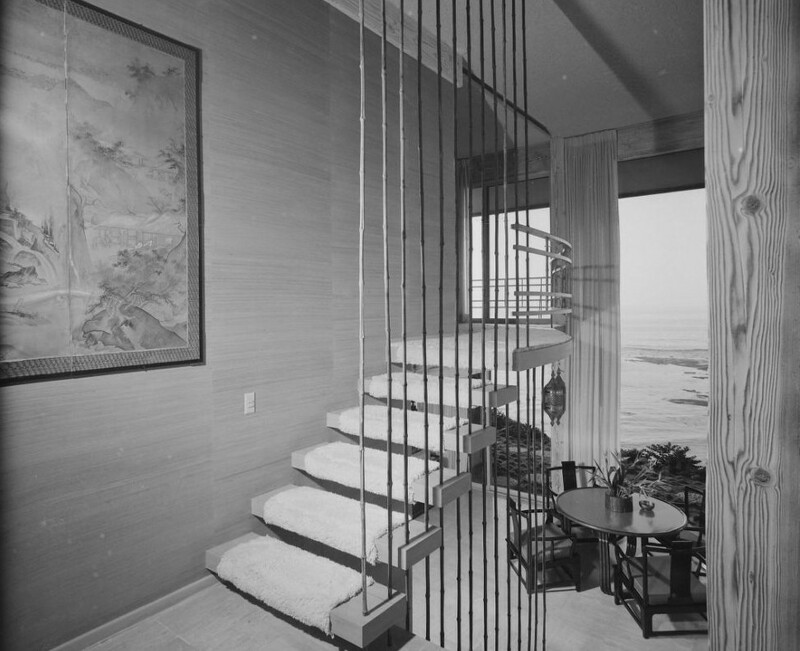 Nothing is more un-modern than an unsightly railing on your stairs. 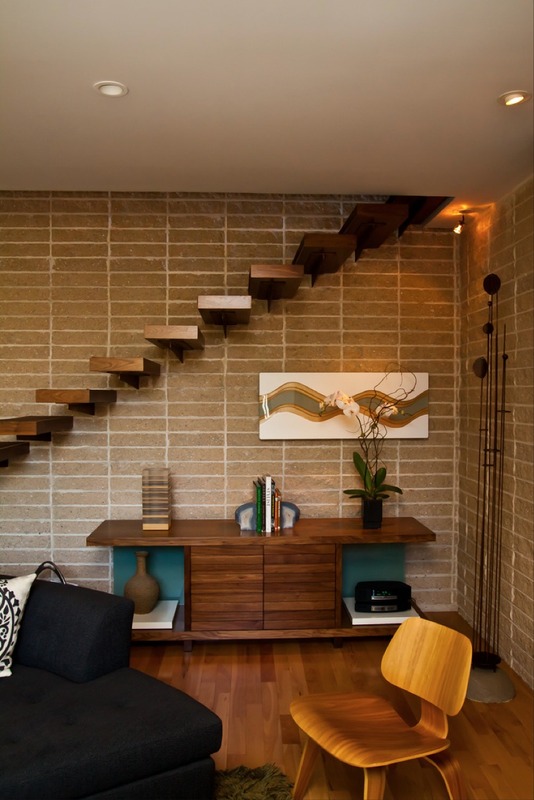 To add extra danger to your mid-century staircase, twist the stairs into a dramatic 180-degree turn, or simply make the angle of the stairs extra steep. These extra-dangerous stairs lead right to the ceiling, guaranteeing a concussion for your curious child. 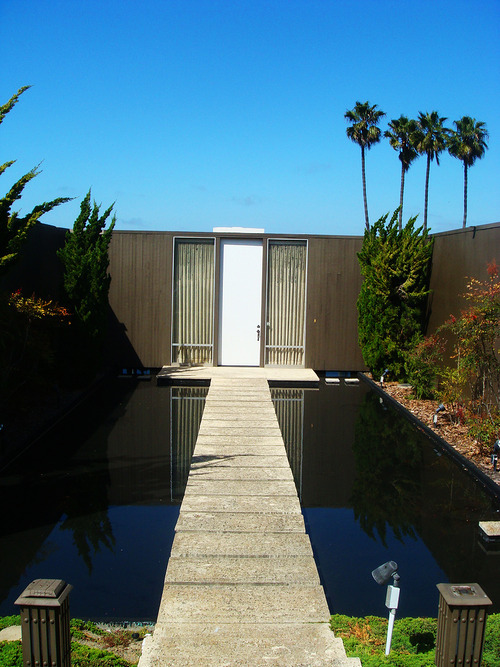 The mid-century dream house below comes with its own on-site medical team, in the very likely event that your children will either drown, fall, slip on those mossy stairs, or impale themselves on a rock. Or maybe that’s dried blood I see on those stairs? If you care about your children’s safety, perhaps you’ll want to settle down in a late Georgian colonial revival. Now I’m in the better-watch-your-step stage of my own. Beautiful but deadly is right. Thanks for the laugh. Those 180 degrees turn stairs; are very common in the Netherlands. Due to lack of space we have often resort to this type of stairs. Sometimes the lack of space leaves no other solution. A pond in a home, certainly if you have small children, not common sense. Outside the home. Due to a lot of rivers, lakes, canals etc. in the Netherlands everywhere, most children learn to swim at a very young age. Many of these houses in those pictures offer dangerous situations however a danger free house/environment is whishful thinking. I think being overprotective and ‘preventing all hurt’ is way more dangerous. I grew up in a house with open fire, don’t remember ever being dumb enough to put my hands in there. The well meaning parents preventing children from doing ‘anything’ could well be a contributory factor in various mass shooting/suicides over the last 30+yrs? Knowing the difference between right and wrong the ‘hard way’ may be a difficult lesson but definitely worthwhile. From funny ha ha article to mass killings. Sounds like someone needs to hug it out. It will be trouble when said adult single breaks a leg or sth and has no railings for support while climbing up and down during recovery.. Cue freak accident. Hilarious! With Australia’s property prices, I don’t think I’ll have to worry about bringing up children in such a stylish house anyway! Found this hilarious! I guess dream homes come with a price. I KNEW I didn’t like MCM! Those stairs are terrifying! Oh my, so many red flags to the juniors. Thanks for pointing out. So… remind me again, why would a kid jump off a roof? Are some people’s kids really that dumb? I mean, if they’re under 2, you could just keep them out of said dangerous areas. I don’t see these as much of a problem. Stairs without railings are probably more deadly for the elderly than kids. Oh gosh, it’s a good thing I didn’t grow up in homes like these or I’d certainly be dead! I came across this post and I cannot stop laughing. I personally do not have children, so worrying about safety would probably come in last place if I ever decided to buy a house. 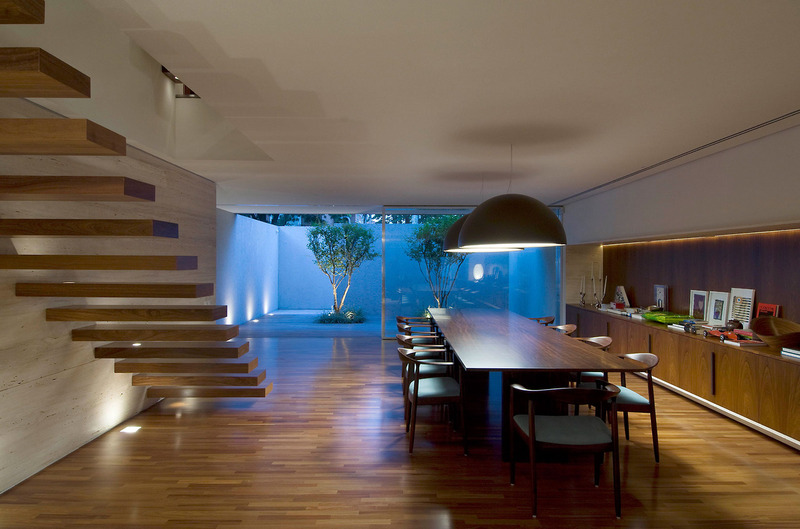 I do love open spaces and modern architecture though. Some, if not all, of the design aspect show on this article are of my liking, but know I am questioning how ready I actually am to become a parent. My poor children would be known at the ER if I get to buy a house before having them. For the sake of my imaginary future children lets home I keep renting. Reblogged this on Monkey's Adventure. 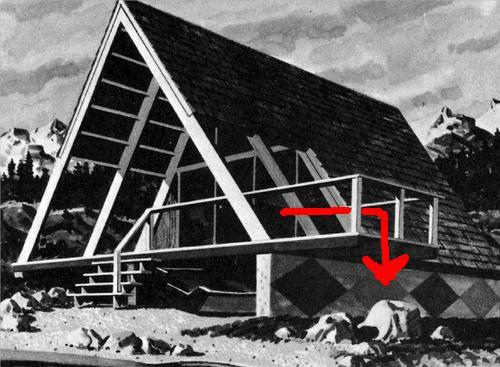 I think that Frank Lloyd Wright did not consider the fact that his architectural style could cause such problems. Nice post! 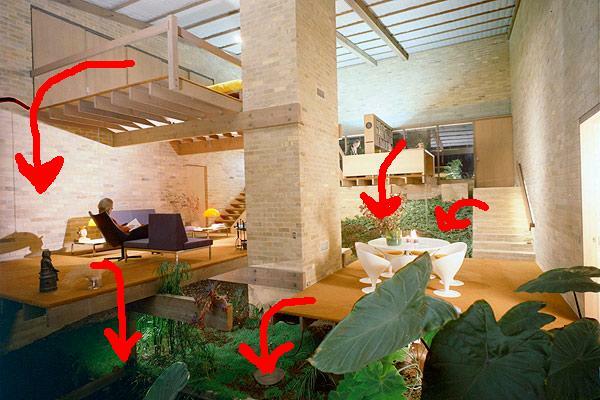 There are no FLW houses pictured in this article, idiot. You are referring to a style that was permitted at midcentury. 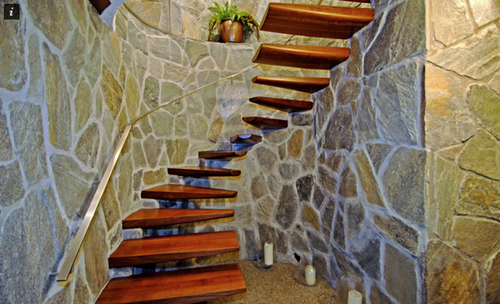 Today’s codes prohibit stairs and elevated platforms that have no guardrails. False. Take a look at homes on Dwell and other websites. Several homes pictured were constructed in the last sev era years. You’ve made your point simply and powerfully. These houses were built by people with more dollars than sense. 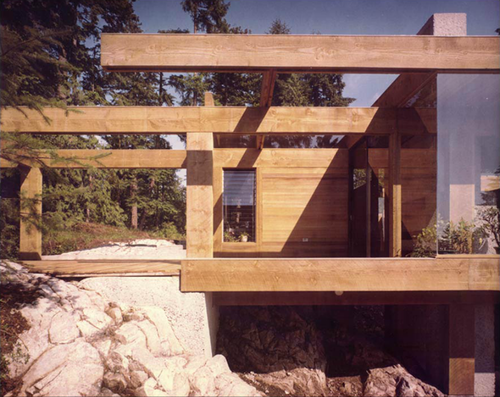 These are architectural follies by definition. Architects and their clients, people with too much money, have drifted away from the very definition and meaning of shelter. Uncooked dairy is outlawed and extremely regulated. As an architect friend of mine wryly commented once: “Form swallows function.” In other words, it’s all about design, the people – old and young alike – occupying the architect’s creation be damned! I little known fact is that the 50s Modern style was a subtle effort to ensure only the fittest members of the human species survived. One might even go so far as to call these houses urban jungles wherein alertness, cunning acrobatic skill, and shear luck determined who made it to adulthood and who became food for the hydrangeas. Hilarious , I’ve always wondered why anyone, young, old , with or without children would tolerate a staircase without safety rails, but hey” looks good don’t it! Just remember” glass, glass and more glass. Nowadays you can baricade anything with solid plate glass instead of unsightly railings . All you need are deep pockets and stock in windex. i think there are too many people in the world to begin with. 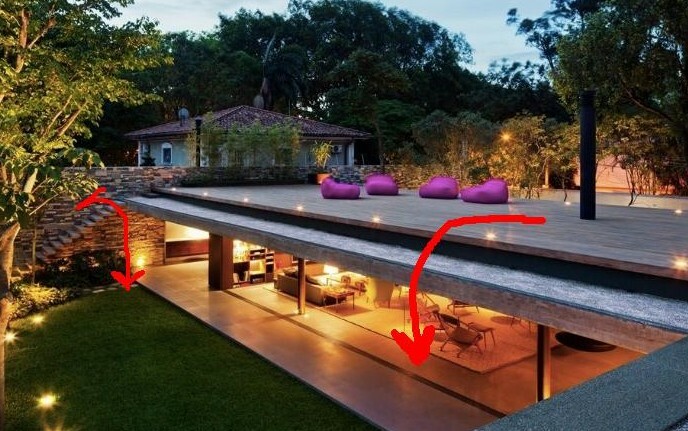 also, anyone cool enough to have an awesome house like this is either too smart to bring anyone in to this world or their children are also smart enough to respect and enjoy beautiful architecture. I’m in my 50’s and grew up in MCM homes and didn’t kill myself. Of course my parents made sure I understood why open fireplaces and stairs can be dangerous. Hell I used to climb on the roof and jump off just for fun, never got hurt, learned how to land & tumble. Relax, teach your kinds about safety and let them have some experiences. That loft railing might have glass in it. Would be hard to see in a conceptual drawing. Forget the kids. I just turned 68 and I’d be afraid of those floating staircases for MYSELF! Most of those designs can be made safe with polycarb panel railings… or thick tempered safety glass railings. But I prefer the ‘smoked glass’ look without the breakability of actual glass. 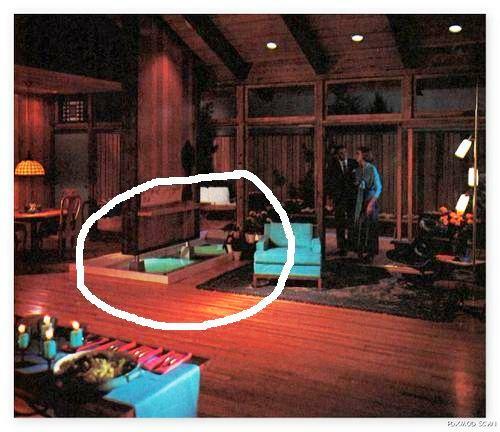 I was eight months pregnant in a design class and the instructor was discussing the finer elements of Mid Century Modern. Maybe it was hormones, but i could not figure out where the energy was going to come from to convince the the dogs, cat and toddler not to pee on the plants. How do you keep a Labrador out of an indoor pond? Or the cat from eating all your fish that your child added to the pond? Stairs with out handrails prior to coffee is and emergency room visit. I lost one of my children when he crawled into a kitchen cupboard, scaled a door frame, and climbed to the top of a linen closet. That was in an 844 square foot townhouse. I was in a pure panic when he started sleep walking! How could anyone ever get a decent night of sleep in a place like those? I don’t even want to know what the insurance coverage is on one of those houses considering the inquisition I went through for our regular, boring, contractor grade, house. Thank you for pointing out the obvious which I did not have the guts to do in design school. Especially after making a comment that the Lascaux cave paintings resembled a football strategy. Liberal art colleges are actually not that liberal. Learning by burning is my motto. The kids will be fine. They’re more likely to get shot at school then break an arm at home falling off the stairs. 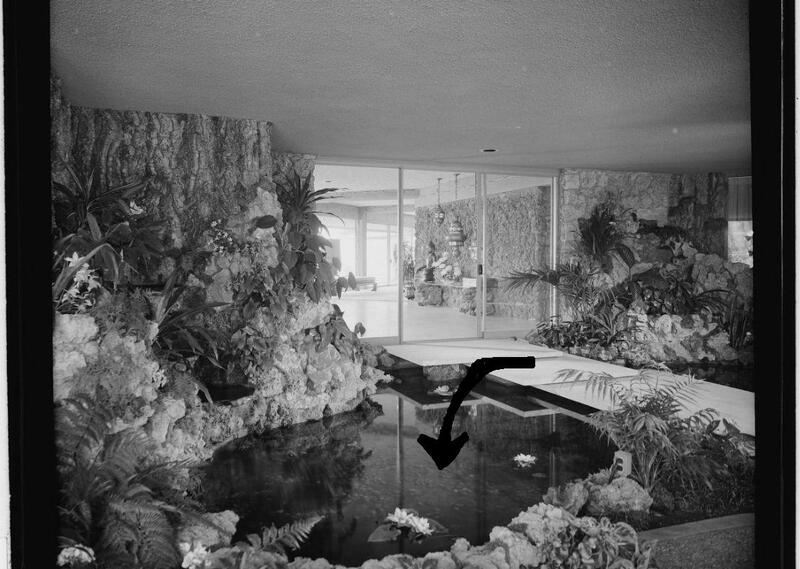 How about the electrical outlet next to the reflecting pond before the GFCI was invented. Kids wouldn’t have to suffer a slow death from drowning but be instantly killed by electrocution.